While many press reports, especially those in English, tried to link this fissure to faulting and earthquake movements, others were more cautious, saying it was caused by movement of water underground followed by subsidence. Which version is correct? Probably neither is completely correct, since geography often fails to provide a single, definitive reason for things! The crack is about 1000 meters (two thirds of a mile) long and up to 7 or 8 meters wide and 10 meters deep. While some press reports erroneously claimed that the crack extended across the main, paved, highway #26 between Hermosillo and the coast, its location was actually some distance away from the main highway. The road shown in the image above is a rural, unpaved road about 80 kilometers (50 miles) west of Hermosillo, in an area of farmland, some of which is irrigated. The available evidence therefore rules out faulting (or earth tremors or earthquakes) as the cause of the crack. Could the fissure have been caused by an underground flow of water followed by subsidence (the collapse of overlying rocks)? This certainly looks more likely though it is hard to imagine significant underground flows of water in an area that is as flat as this. On the other hand, this is (a) an area of newly constructed irrigation ditches and ponds, and (b) it received heavy rainfall a few days before the crack was reported. In all probability, the fissure began as a deep but very narrow “subsidence fissure” where differences in irrigation (or in water extraction) caused some parts to be much wetter than others. The soil and rock particles in wetter areas would tend to expand, while those in drier areas would tend to contract. Such differences could lead to the formation of small initial fissures. Once the fissure had been started, localized heavy rains and the resulting overland flow could then result in streams flowing (temporarily) in these initial fissures. The moving stream water would rapidly widen and deepen the fissures into the scale of crack shown in the photos. The initial fissure may have been formed several years before this widening process occurred. 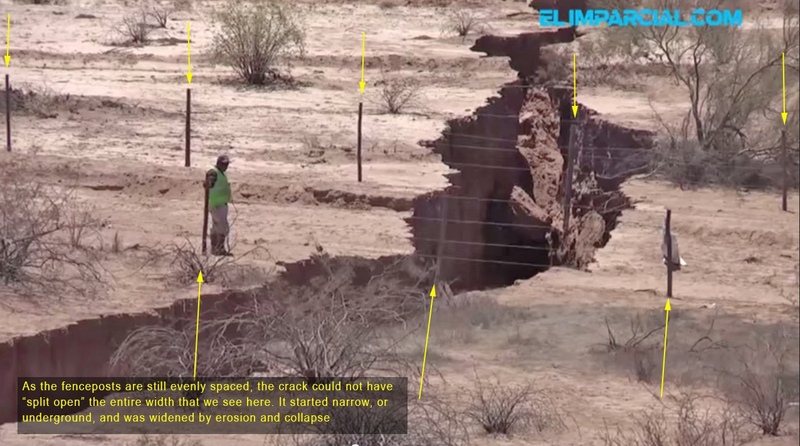 For a more detailed look at the evidence for this fissure’s formation (and its true location), see Debunked: The Earth Splitting Open – Giant Crack in Mexico. This feature really looks like an earth fissure which is a tensional crack formed in response to land subsidence and differential compaction of basin sediment. The subsidence in this part of the world is typically driven by groundwater withdrawal and earth fissures often form in areas with shallow subsurface bedrock or buried cemented sedimentary layers. 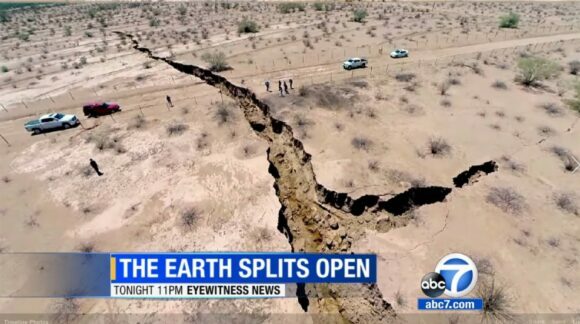 We have many earth fissures in AZ, newly opened fissures look pretty much just like this crack in Mexico (the drone footage is great!). Often a narrow crack exists for years before it is abruptly opened by erosion coinciding with heavy rains (same pattern here). I work for the Arizona Geological Survey and we have a mapping program to document the extent an locations of earth fissures in AZ, we have an interactive map and downloadable fissure maps on our website (links below). We consider earth fissures to be a geologic hazard created by our overuse of groundwater. Earth fissures typically do not form in areas without significant groundwater use, at least in the southwest US. Given the setting where this crack formed I’d wager it’s similar to our AZ fissures.